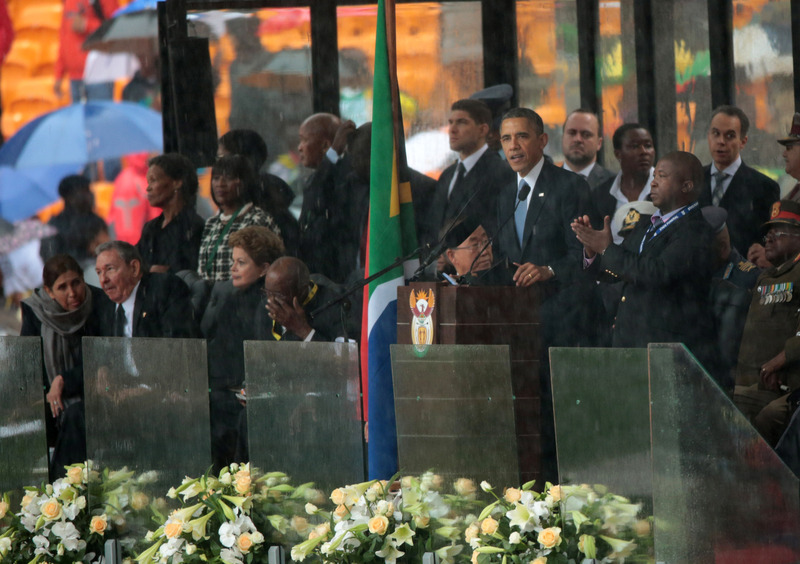 Well, now we know what was going on with that "fake" sign-language translator at Nelson Mandela's memorial service Tuesday: the translator, Thamsanqa Jantjie, allegedly hired by the state from a "sub-standard" translating company, told the Associated Press that a schizophrenic episode affected his signing. The illness has caused him to be violent before, Jantjie said in a 45-minute interview, and at Mandela's service he'd hallucinated and seen angels entering the stadium. Jantjie added that he'd once been hospitalized for a year in a mental-heath institution. Sign language experts said the man was not signing in South African or American sign languages and could not have been signing in any other known sign language because there was no structure to his arm and hand movements. South African sign language covers all of the country's 11 official languages, according to the federation. Jantjie said in an interview with Johannesburg's Star newspaper that the hand gestures were the result of trying to stay in control when there were "armed police" around him: "I was in a very difficult position," he said. "And remember those people, the president and everyone, they were armed, there was armed police around me. If I start panicking I'll start being a problem. I have to deal with this in a manner so that I mustn't embarrass my country." But it's possible that Jantjie wasn't signing under safe conditions in the first place: Translators are usually switched out and replaced every 20 minutes to maintain concentration. Jantjie was on stage at one of the biggest events of the year, signing for world leaders, for three hours straight. Jantjie noted he had a professional track record of interpreting that had so far been clean. But the damage to his professional reputation is done, given how offended deafness associations were and how strongly they felt that the botched interpretation desecrated Mandela's memory. Before it was known that Jantjie suffered from schizophrenia, several organizations came out with scathing critiques. “This ‘fake interpreter’ has made a mockery of South African sign language and has disgraced the South African sign language interpreting profession,” the Deaf Federation of South Africa said. The CEO of the British Deaf Association, David Buxton, was equally harsh: "It was hours of complete nonsense,” he said. “He is clearly a fraud who wanted to stand on stage with big and important people. It’s quite audacious if you think about it." To add to the debacle, no one at the time knew who the translator was. South African deaf organizations weren't aware of him, and he wasn't a member or associate of the African National Congress. Even the President's office, for whom Jantjie signed last year, said they didn't know who he was. Now, with Jantjie's identity revealed, the South African Deputy Minister of Women, Children and People With Disabilities, Hendrietta Bogopane-Zulu, said the office is looking into how the situation could have happened. However, the company who he was hired through has apparently vanished. But the hiring issue could have stemmed from inside the government as well: Apparently the translation company Jantjie was affiliated with wasn't exactly top-of-the-line, and they severely underpaid their workers. A member of the government who hired from a service like that, for a service like Mandela's, would be held accountable.